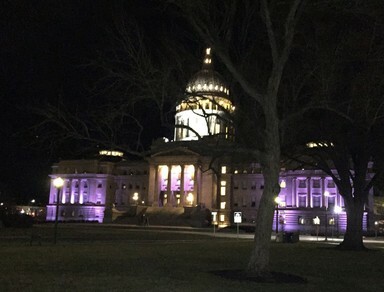 February 2, 2016 The Capitol lit up tonight in pink in recognition of American cancer prevention awareness day. 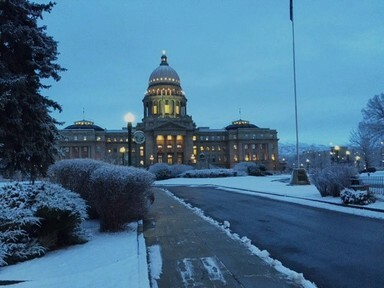 Winter again at the Capitol. In Rev & Tax Committee - H380 Proposal to reduce the top two individual income tax brackets by one tenth of one percentage point from 7.4%to 7.3% and from 7.1% to 7.0% and increasing the grocery tax credit (GTC) by $10 to those in the remaining 5 brackets. For a complete analysis go click here. In the Business Committee: We discussed bill dealing with morticians Licensing, rules on Real Estate Appraisers, Barber Schools and funeral establishments. 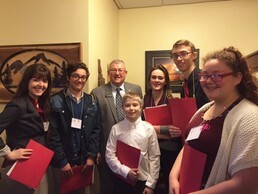 I met with these young folks from the Treasure Valley and visited about ‘Safe Routes to Schools’ initiative. 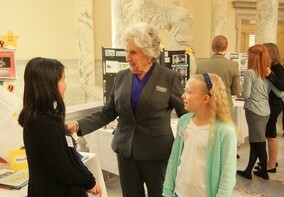 Visiting with Home Schooled students about their projects during 'Pie Day' at the legislature. 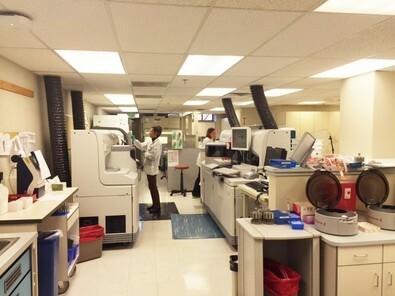 I visited with the St Luke’s Clinical Lab Scientists. This week I also met with the Idaho Insurance Council, Idaho Assn of counties, American Heart Assn, among others. It was a good week with a lot of activity. Agriculture Committee - On Tuesday, Dr. Garth Taylor provided information to our committee about the “Economics of Idaho Agriculture.” In his presentation he talked about fluctuating prices as well as the forecast for the agricultural industry this year. He also talked about the Trans-Pacific Partnership as well as the drought/water situation in Idaho. Gretchen Hyde, Director of the Idaho Rangeland Resource Commission, finished the meeting by giving a quick update about the commission and a little about the two main focuses they have, which are education and outreach. Gretchen also shared with the committee the “Life on the Range” video which depicts what it is like to live out on a farm or a ranch. Click Here to view this video. Education Committee - Lieutenant Governor Brad Little presented before the Joint House and Senate Education Committee information regarding the State Board of Education’s “60 Percent Goal”. Reading proficiency is an important component in this program and was emphasized in detail. The committee also discussed the professional/technical aspect of education and what role it has in our school system. We were delighted to hear from past “Teacher of the Year” award recipients. Melissa Ferro (2014 Teacher of the Year) and Kim Zeydal (2015 Teacher of the Year) both reported to the committee what they are working on in their local schools. We also heard from Sherri Ybarra, the State Superintendent of Public Instruction. In her report she gave an overview of the schools. She has been working with the Governor’s Education Task Force as well as the State Board of Education to improve Idaho’s educational system. 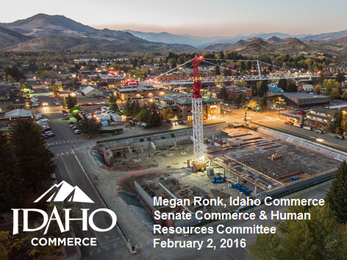 Commerce and Human Resources Committee - This week our committee approved the gubernatorial appointment of Megan Ronk as the Director of the Department of Commerce (DOC). 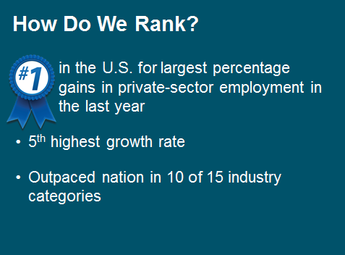 We also viewed a comprehensive presentation by the Department of Commerce. You can access this entire presentation by clicking here. A very nice break in this week was the annual visit by the state’s home schooled students. 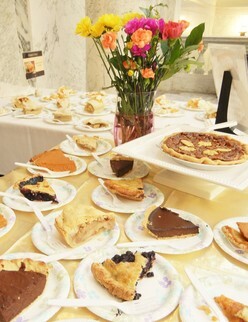 They had great displays, provided beautiful music, and served the best home-made pie in Idaho. 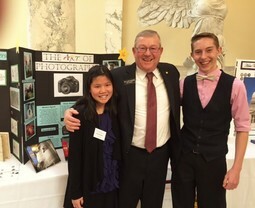 I enjoy so much visiting with these wonderful students and learning about their hobbies and interests. For the first three weeks of the session, most of the activity has taken place in the committees. However, the bills are finally coming to the floor for action. My budget committee is still in the hearing process and will begin the budget action on February 22nd. All the experts seem to believe the economy will be stable for the next three years. We set budgets for eighteen months ahead, so we are always a little more cautious. A very sobering report about the agriculture sector which is so important to our valley does not sound as good. The prices for farmers and ranchers have been on a five year high cycle but will be off about 10% for 2015. The price for milk is leading the pack at 27% decrease. Tied closely to our agriculture economy is the need to better manage our shrinking water supply. We irrigate 300,000 acres with many jobs dependent on an abundant water supply. The budget will address this issue by providing funding for better aquifer recharge. We created the crisis and I believe we can fix it with proper response. Another very large obligation for each year’s budget continues to be the cost of forest and range fires. The bill for this past summer is over 64 million up from the last bill of 27 million. The Department of Lands continues to work on fire prevention efforts. Over 300 ranchers have been trained and equipped to help with the first response. These are our endowment lands and bring additional money to support education. In spite of the fires, this past year has brought income at a fifteen year high. The seventy percent which goes to education will provide about 60 million. As we finish the many areas of education funding, the message stays very loud and perfectly clear. There will be 60,000 new jobs in Idaho by 2020. Most all of them will require additional education after high school, including either a degree or certification. We are seeing lots of emphasis on more math and science with labor and industry acting as full partners in many of the state’s efforts.